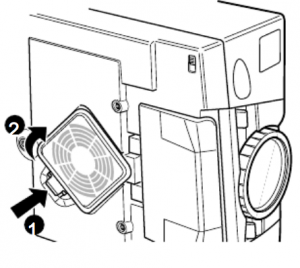 This guide shows how to clean or replace the Epson EMP-5500 air filter. Clean the air filter at the bottom of the projector after every 100 hours of use. If it is not cleaned periodically, it can become clogged with dust, preventing proper ventilation. 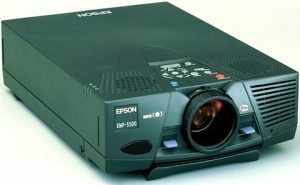 This can cause overheating and damage the projector. Keeping the air filter clean will prolong the life of your projector. Turn the projector on its side so that the handle is on top and you can access the filter easily. Note: Standing the projector with the handle at the top keeps dust from getting inside the projector housing. Pull up the filter cover tab to release the filter cover. Remove the cover. The filter is attached to the inside of the filter cover. It is recommended that you use a small vacuum cleaner designed for computers and other office equipment to clean the filter. If you don’t have one, use a dry, lint-free cloth. If the dirt is difficult to remove or if the filter is torn, replace it.